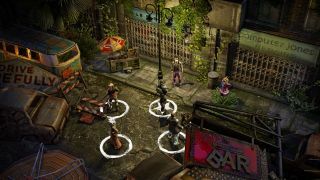 The Wasteland 2 Director's Cut, originally announced as the Game of the Year Edition, will make a number of improvements to inXile's hit post-apocalyptic RPG. Quirks, perks, precision strikes, expanded voice acting, and balance changes are all on the menu, and it will also be given an extensive visual upgrade thanks to a move to the Unity 5 engine. And it will all happen, the studio announced today, on October 13. "We're now in the home stretch of development," inXile wrote in a new Kickstarter update. "Our final tasks in the several weeks before final release include polishing up the game as much as we can, including tweaks, optimizations, fixes and balance adjustments. We hope you will enjoy the changes and updates as much as we enjoyed bringing them to you." October 13 is a bit later than the "late summer" launch we expected, but the Director's Cut sounds like it's going to be a pretty major upgrade. It will also be free for anyone who already owns the original Wasteland 2, which I think makes the wait a little more bearable. Have a look at some of the improved eye candy in the updated screens below.